Separate 8 big leaf from the cabbage. Cut the cabbage stalk from all leaves. In a big pot boil water and put every leaf separately there for 2 minutes. Mix turkey with carrot, rice and spices. Separate the mix into 8 potion. 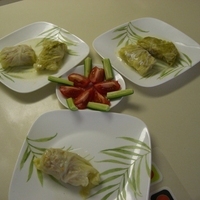 Put 1 portion of mix in the middle of cabbage leaf and make an envelope. Put 8 "Golubcy" in a big pot and cover them with water. Cook slowly for 30 minutes, then add 1/2 pack of sour cream and bouillon cube and cook 20 more minutes. Tried this the other night. It's different from anything I've had before. It's like something delicious you might try at Dim Sum, but with western flavors (sour cream) instead of soy. This is definitely worth trying if you've never had it!